Harassment, bullies, violence, exploitation … what causes them? And what causes wars? Is there a common link between the psychology behind abuses and wars? 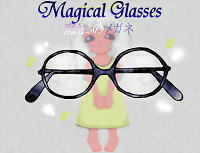 The picture book "Magical Glasses" tries to explore such an issue. This picture book explores the cause of abuses on a broad scale and the psychology of their bystanders. Domestic violence, child abuse, sexual abuse. Discrimination, suppression, slaughters, purges, ethnic cleansings or the Holocaust to those who are weak/minorities and have different views, religions, thoughts, ideas, skins etc. Carpet bombings, invasions or colonial wars by mighty nations. Needless to say this, violence in the classroom and carpet-bombings are totally different events. However, from a psychological viewpoint, I believe that embedded in these two events is a common belief/illusion. And there would be bystanders at these cruel scenes of abuse or wars, those who refuse to see the startling truth. I am appalled by the suppression of stronger parties against weaker ones that seems never-ending in our society. Yet so many merely look on blindly or give silent approval to these attacks. Why do humans one-sidedly attack those who are weaker than them? Why do people continue to do nothing and continue to let such cruel actions happen right before their eyes? It is natural to have these doubts and leaving them as they are could lead to the loss of faith in the human race. However, there is a reason behind this. There is no need to lose faith in humanity. I hope you can empathize with the psychology of ordinary people in this picture book and realize the horrible dangers of neglecting the root cause of abuses. *Some of the contents may be disturbing. @The picture book below is the original which the writer painted over 10 years ago.